The project is solely the work of the author and is submitted in partial fulfillment of the requirement of the degree of Master of Business Administration. First of all we would to thank FAST School of management for giving us the opportunity to work on this project. Secondly we thank our families and friends for the continuous support system they had provided us. Our advisor, evaluations committee, teachers and our peers for their guidance and direction with out which this work would not have been completed. Several studies have shown the positive relationship between stress by health and social activities affecting the academic performance of students. Many researches on this topic are done either on gender basis, different educational levels to find out the affect on academic performance of students. It is within this research framework that we want to find out how much stress on gender basis affects the academic performances of Masters Students of National University of Computer and Emerging Sciences. 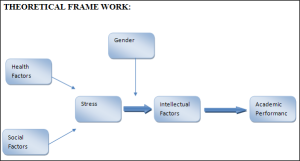 Consequently, this paper attempts to determine the factors of stress resulting from health and social factors affecting intellectual factors which on further analysis on gender basis affect the academic performance of students. To accomplish our objective, we took two samples of Master’s students enrolled in NUCES. First group was of 50 Male students and second was of 50 female students enrolled in 2012 and 2013. By administering our questionnaire survey, information related to topics, past researches, Spss analysis, and graphic representation we got to our final results. Results are presented graphically, inferentially and descriptively. Regression analysis and Independent Sample T test are done for the analysis to check the predictions of independent variables on dependent variable and difference of affects on gender basis. Keywords: Social Stress, Health stress, Intellectual Stress, Academic Performance, Thesis Statement example, Research paper topic. Having mentioned that, there was a need for identification of Stress and the key stressors that are affecting the academic performance. We further refine the research by studying the effects on Master students and make it a gender base study which will help us to differentiate between the effects and innate intuition of managing with stress in male and female students. For the very purpose, it was notorious that there broadly are two stressors that are external in nature and have a solid impact on person’s abilities. These stressors include, Health Factors and Social Factors. We are taking the Intellectual Abilities and Academic performance to be the dependent variable where as stress is regarded to be an independent variable. The type of research is Quantitative whereas 100 is the number of participants and our sample size that is to be included in the research. Research will be conducted and based on the Master students in National University Lahore campus while the study will be carried out on gender bases and the results will further be compared for understanding of any difference or similarity between the effects of stress on different genders. Our literature review will base academic performance, intellectual abilities, Stress, two identified stressors and each dissected to an extent, and the impact of stress in academic elaboration in both genders. Student’s academic learning and performances can be affected by many factors such as gender, age, teaching staff, father/ family’s economic condition, family’s social status, total study hours, and accommodation of them as hostelries or day scholars (Pritchard, 1996). Many researchers have been done by scholars on finding the factors which contributes on student’s academic performance and achievements at different educational levels. A study suggested that student’s educational performance and achievement relies heavily on social status of parents and guardians of them (Graetz; 1995). Research done by Considine and Zappala also found the similar results that social status and family’s income is positively correlated with the student’s performance in academia (Considine and Zappala; 2002). Some of the researchers found that previous academic performance is also a factor affecting current academics of students. 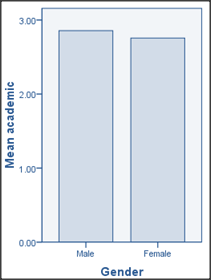 As found by a research, performance of students in higher education level depends on the undergraduate level of studies (Minnesota; 2007). Also found in another study, past educational performances of students is considered to be an important indicator in finding the future achievements of them, as said that better the previous academic performance; the better will be in the upcoming endeavors (Durden and Ellis; Staffolani and Bratti; 2002). Researches also indicated that employment is also one of the factors that effects academic achievement of students. They resulted that it affects negatively on its performance as the more the number of hours they work, they more they are distracted from academics. They mentioned that more working hours will decrease the probability of being ‘A’ Grade student (Pritchard, 1996). According to other researchers, it is not about doing the job which creates the problem in managing the work load of studies. It is about the amount of work done as the students who work more spend less time on their studies and also pay less attention during their classes (Steinberg & Dornbusch, 1991, p. 307). We can resolute the student’s academic achievements by their performances in their institutions, their activities and assignments done in classes, presentations they give and results of their exams (Ong, Bessie, and Cheong, 2009). Research have been conduct in order to review the relationship among stress and academic performance of students and it has been found that stress affects the academic performances of students in great manner (Elliot et al., 2005; Choi, Abbott, Arthur & Hill, 2007). Students complained about the stress they feel while giving their exams or any competition regarding grades or in any case when they have so much to study and less time to do it. They say that it really affects on their performance of work (Carveth, Gesse & Moss, 1996). One study reported that stress among undergraduate business students is a notably important factor which is interrelated with poor performance (Bennett, 2003). A research found that student’s attitude towards the learning of working ethics is related to the academic performance and achievements (Conard, 2006; Jansen & Bruinsma, 2005). It is also found, that confidence level of students in themselves in terms of academics and their managerial abilities as how they manage their academic work load affects their academic performance (achievement (Richardson, 2011; Yip, 2009). Students who are coming to colleges and universities for only professional outcomes meaning to get the job, and earn good money will have totally different thinking and approaches inside the classes and during their studies because they will be attending it for their personal knowledge enhancement. There approach for the acquisition of education with so much motivation dominantly affects their academic performance and achievement (Durik, Lovejoy, & Johnson, 2009). Additionally, family’s expectation can be a big factor that can affect the motivation level of student on their academic performances and they must be considered as an important point as attitude towards education (Mutsoto & Abenga, 2010). A study examined a significant correlation of academic performance with intelligence level among the students of high school on gender basis, and found that the relationship among intelligence of a student and academic performance of them is higher among girls. They also found that socio- economic status is not affecting the student’s academic performance notably among boys and girls, and that the academic performance of urban girls and boys are higher than that of rural ones. They resulted from their research that academic performance and achievements of girls are much more superior to that boys (Mishra; 1997). Coming across a research, it has been found that the most important learning behaviors which affects the academic performances of students are the group study/ independent study sessions, discussing the material when needed with group mates and class activities, involvement in class, their backgrounds, and discussing the course and class material with faculty when needed (Bennett; 2011). In another study, it is been concluded that study behaviors of students and their attendances are more important and affective towards their academic performance as compared to the utilization of their text books (Berry, Cook, Hill & Stevens 2011). In one research it is been found that the academic performance is combination of social status of family, parent’s involvement with their children, and school managerial behavior with their student activities. They said that combination of these factors effects the academic performances of students in positive manner despite the gender differences in them (Haseen; 1999). In another research results showed that age and gender differences are the two important factors which affect academics of students. But according to the analysis, they found that rather than intellectual quotient gender differences is the factor that is more important variable that affects the academic performances as girls were in higher ranking than the boys in their performances. Results also showed that the communicating skill, requirement of attentiveness and convincing power among girls was higher than boys (Suneetha et al, 2001). Anything which poses some kind of threat and challenge upon us is known as stress. We use the word stress in such conditions when we feel “it’s too much”. We start to think either we will be able to handle the workload or situation (Nordqvist 2009). Stress is a reality which we have to face in our everyday life. There are situations when we start to feel ourselves out of help and start to disturb emotionally and other stressors. Many people consider stress as an incident happen to them such as injury or job loss (Centre 2010). Others think stress is some kind of changes which happen to our physical body, behavior and mind or over thoughts about situation. Any situation which causes frustration can also be cause of stress. Everyone have different skill and capabilities so their style of handling the situations could also differ and it is same for stress level for each person. It is possible stress level will be different for two persons which are facing save situations. It depends on which kind of stressors affects them both. Stress is not an extraordinary thing it is just the part of our daily life. And even it is good for us if its amount is not too much. It can improve our motivation and also help us to improve our productivity (Centre 2010). It depends on how we perceived about stress. It depends how we react against it, it can affect us negatively as well and if we always react or respond negatively against stress it also could affect our health and happiness (Robinson 2010). Our body naturally gives response upon different types of situation and if the situation is not favorable, it’s dangerous or you feel threatening it alarms us and it is called anxiety (Robinson 2010). And it may cause an unpleasant feeling about the situation and it can also have an impact on our performance. It may can decrease our performance in the same situations in which we have performed better without stress. Another negative result which stress produce is that, it can make them realize us that situation is out of our abilities or simply it makes our perception that situation is beyond our abilities and we can’t handle it (Centre 2010). After reading several articles on stress and its impact on humans, one thing is very clear that experts agree on this point that stress some time directly affects our body systems. When we start to feel stress sometimes it causes our blood pressure to rise than normal. Some start rapid breathing. And one of the very common effects is the change of heart beat, heat beat rate usually increase significantly when we start to fell stress and our muscles start to feel tense due to stress even without any physical work load. Some face disturbance in sleeping and cannot sleep comfortably. There is another point to should be kept in mind that stress always not came due to only external factors. It also rises due to internal factors as well. Which consist of feelings, thought, and behavior and habits, there are some most common factors which can cause for negative stress (Nordqvist 2009). Stress could also be depending upon our behavior. It means sometime our behavior about work could also cause stress if we over scheduling our workload and not careful about physical health and failed to maintain the health. Stress and threats varies from person to person it depends heavily based on their past life experiences. Some people may start to feel negative with very little of unfavorable aspect and situation and others who are very strong and secure background may not fell stress as much in same situations and conditions and working loads. There is another focus group which says stress itself is not a problem but problem is how we handle stress. If we are not handling it well then it well cause problems otherwise it won’t cause any problem. And if we will not handle it properly it will seriously affect our behavior and thoughts (Centre 2010). These are also some common impacts of stress upon human behavior and thoughts. They show anger, feel depression, having problem in memorizing things, got irritate even with no reason and start to feel sad. Stress also changes their behavior some times. People start to eat too much or too little due to stress, some starts to taking drugs or smoking because they feel it will give them relaxation. Some people withdraw social relationships under stress and some start to cry. It’s not necessary that everyone will face all of these. Some can have few of them and it can be different for other one but whenever person feels stress some of these impacts will came with stress (Nordqvist 2009). The most significant affects on health related issues are due to exercise, sleeping habits/ wakeup time and their diet routine; and thus affecting the student’s academic performance in significant manner (Hammer et al., 1998). Studies showed that the students who exercise more than seven to eight hours on weekly basis are lower on their grades than the other students who exercise for six hours almost or the ones who doesn’t exercise. They say that students specially taking out time from their study hours for exercises affect their grades in bad way (Trockel et al.’s; 2000). His study also showed that the students coming to campuses for exercises can make them physically healthy but mentally exhausted for studies. Research studies have shown that there is a huge affect of sleeping habits on student’s performance. They are been classified in three categories which are short sleepers, long sleepers and average sleepers. Short sleepers are the ones which sleep for almost six to fewer hours than this. They probably have their own schedule of sleeping. However, average sleepers are the ones which sleep for almost seven to eight hours whereas; long sleepers are the ones which sleep for more than nine hours (Lack, 1986; Kelly et al. (2001). The results of these researches tells us that the students who sleep more, end up with greater GPA’s as compared to the students who sleep less because less sleep creates more stress and mental disturbance affecting their academic performance. Pilcher and Walter resulted from their research that deficiency of sleep has a negative affect over the performance of students. Mental health is visibly associated with academic performance and retention (Backels & Wheeler, 2001). Academic consultants says that in today’s competitive time mental health issues affects students and their performance a lot more than before (Young, 2004). Faculty members and staff members also noticed that these mental issues are commonly widespread among the students they teach. Stress can have an adverse as well as direct impending effect on the health of students because of the health related behaviors. A study also tells us that exercise done on the regular basis is correlated with increased level of competency in students as it lowers down the anxiety and depression level in them. It has also been found in researches that physical activity of students and their healthy diets such as unsaturated fats and low sugar helps them in their health behaviors which affect their cognitive as well as academic performances (Hillman CH, Erickson KI, Kramer AF; 2009, Francis H, Stevenson R; 2013). The freshman year of the students in universities is mainly the time when they have lots of changes in their lifestyle and health behaviors. That’s why they say that Grade Point Average (GPA) of the students which is used to see a student’s academic performance might get affected by its health related behavior and activities specially during the first year of university (Deforche B; 2013). The researches done on the secondary schools shows that student’s health behavior like diet, active as well as sedentary lifestyle is linked with their academic performances. Though literature on this topic is very limited in university going students and is specifically done on U.S citizens (Sigfusdottir ID, Allegrante JP; 2010). A study suggested that students who are involved in exercising habits are the ones more active and gets higher GPAs than other students (Keating XD, Castelli D, Ayers SF; 2013). One research showed that students who are active in their behavior and lifestyle as compared to the sedentary ones gets more GPAs and are positively correlated. They found that watching TV, reading or computer surfing was negatively correlated with their academic performances among university students through results of their research (Anand V; 2007). According to one study, only taking breakfast was positively linked with students health affecting their academic performance however no other diet related intakes such as fruits or juices were having a significant effect on their academic performance (Trockel et al., Barnes MD, Egget DL; 2000). Many of the researches also have found that there is a negative relationship in the intake of alcohol and academic performances of students (Singleton RA; 2007, DeBerard MS, Spielmans GI, Julka DL; 2004). It is also found that smoking also affects health of students and affects negatively onto their academic performance (Spielmans GI, Julka DL; 2004). A research was also done on students of all age, which showed us that sleeping habit and quality of sleep is also correlated with learning capacity of students and affects academic performance of them negatively. However, proper sleep found significant correlation among the academic performances and their health (Eliasson AH, Lettieri CJ; 2010). Stress is the topic which requires time and effort to be understood. The strain in human mind is miserable and because of that, it is of importance to get to know it. Teams of mental health care in South Glasgow have branded the list of factors in our social surroundings that have a tendency to cause stress. The items in the list are; family issues, being only parent, unemployment, meager education, money issues, health issues, no recognition, inadequate housing and dreadful neighbors. According to the team, above mentioned are the factors that can make any normal human being prone to stress. Still these factors do not cover the complete story. There are people that are prone to stress while not having any of these social issues to deal with. While there are also people who have to deal with the identified social issues yet they do not show symptoms of stress. How much power does one have over of his life? How much pressure is on one? The higher the demand and the lower the power, makes you more prone to stress. A publication by Kessler RC tells us that there are evidences which support that a very vast majority of people who are open to the elements to stressful life of constant stress condition yet do not develop noteworthy psychiatric harm. However it has been previously assumed that these are social factors and the stressors that cause the psychopathology. A research by Paola Palanza, Alberto E. et al. about social factors and individual vulnerability, have unfolded the understanding stating that any person open to the elements to constant stress may or may not develop the disease where as the cause of individual differentiation and the consequences of variant in vulnerability if of key importance. Researchers planned to bring forward the argument by exposing a subject to new environment of chronic stress. The subjects included Resident and intruder which were in continuous monitoring and interacted with regularly. There were categories established, 1) Dominant resident, 2) Subordinate Resident, 3) Dominant intruder and 4) Subordinate intruder. It was found that different subjects were responding different under same circumstances. The research also explained the impact of the loss of certain resources which is a key influence to enlighten the reason due to which only certain individuals who are exposed to stress show mental illness. A stressful condition make a person apprehensive and anxious and powerless to cope which causes damage to health and ultimately leads to premature death. Psychological and societal issues cause a chronic stress. Things such as uncertainty, anxiety, a reduced amount of self-esteem, isolation and a lesser amount of control over home and work life make a strong consequence on mental health. Above mentioned factors accumulate during a life of a person and results in bad mental health and ultimately leads to premature death. Uncertainty, less support from family and friends and extended anxiety causes damage when rises in any aspect or part of human life (Pritchard, 1996). Another research tells us that the industrialization also has affected the social life and the causal chronic stress. It states that people who are in lower circle of social hierarchy in under question countries are more exposed to the effects of stress. Medical science response to the damages is that our nervous system automatically plans to deal with threats in emergency by initiating the reaction. These reactions include modified heartbeats rate, gather together force/energy and avert the flow of blood to muscles to create attentiveness. Since the easy urban lifestyle requires very little of physical activity which causes the reactions to stress to redirect the energy away from physiological development that are necessary for the extended duration of mental health protection. With this redirect of resources, the immunity and cardiac functions are affected (Hammer et al., 1998). Life expectancy is shorter and most diseases are more common further down the social ladder in each society. Poor social and economic circumstances affect health throughout life. People further down the social ladder usually run at least twice the risk of serious illness and premature death as those near top. Not are the effects confined to the poor: the social gradient in health runs right across society, so that even among middle class office workers, lower ranking staff suffers much more disease and earlier death than higher ranking staff. Both material and psycho-social causes contribute to these differences and their effects extend to most diseases and causes of death. Disadvantages have many forms and may be absolute or relative. It can include having few family assets, having a poorer education during adolescence, having insecure employment, becoming stuck in a hazardous or dead-end job, living in poor housing, trying to bring up a family in difficult circumstances and living on an inadequate retirement pension. These disadvantages tend to concentrate among the same people and their effects on mental health accumulate during life. The longer people live in stressful economic and social circumstances, the greater the physiological wear and tear they suffer, and the less likely they are to enjoy a healthy old age. Intellectual abilities are the skills required to perform mental tasks. There are different types of intellectual abilities, such as memory, creative thinking and vocabulary. Intelligence tests measure a person’s general intellectual ability by testing them on several factors. Intellectual ability applies to both academic and work settings. High intellectual ability in an academic setting is marked by a long attention span, and it is often marked by both attention span and leadership skills in a work setting (Gabriel 2010). An advanced ability to learn and process information rapidly. An extreme need for constant mental stimulation. A need to understand the world and for it to be logical and fair. An ability to relate a broad range of ideas. Curiosity; endless questions, inquiries and appreciation. An inborn sensitivity and awareness of life. A need to explore some topics in greater depth. Demonstrate different or unusual interests compared to their same age peers. Reach developmental milestones earlier and faster. Read early or understand math concepts at a very young age. Hold themselves and others to high standards. Intellectual ability is similar to your IQ. It is where your ability to work in an intellectual way is stronger than most others. Although people with intellectual ability are said to be clever or smart. Intellectual development includes thinking, problem solving, understanding concepts, processing information, and overall intelligence. As a child develops cognitively, she is able to navigate her surroundings and the world. Behavioral development is reflected by children’s actions in or responses to their environment. These responses may be voluntary or involuntary, conscious or unconscious. Play and interactions with other people and objects within the environment are important in cognitive and behavioral development (Kelly Stanton 2009). Intellectual capacity is differ from person to person. One person could be more intellectually powerful or weak than other. Intellectually strong person can have high level of expertise than the person who is not intellectually as strong as him even with the same hours perform on specific job. It may be able to perform it more efficiently than the other and handle different or multiple issues at the same time or comparatively better (Thinking 2010). An Intellectually strong person can analyze different situation better than others. It depends how strong he is intellectually. He absorbs different information rapidly than other, processes them and makes conclusions, build different theories, tries to find different alternatives and even tries to evaluate those alternatives as well. And if they get into implementation stage he always trying to understand the aspects appearing during implementation which were not visible at the time of making decision and it’s the ongoing process which never stops for him (Cnchikwe 2009). Intellectual abilities force the person to always getting or extract information about surroundings or in whichever situation they are (Listening, solving the mathematical problem etc.) They are continuously processing this information and build their next steps of thinking upon it. As research proved an average person thinks 400 words in a minute while he only can speaks around 125. A person with intellectual ability can even think more than 400. Normally they also have Intellectual courage as well which is something like confidence on own idea and free and fairly address of it. Even if there is a possibility of strong resistant against the Idea. The courage relates to recognition of the negative responses about the ideas but persons commitment to stand on it and give rationale and trying to justify it (Gabriel 2010). Intellectual abilities directly relates and the bottom line is a person who have better Intellectual Ability can use his mind in a better way than a person with lower intellectual abilities. He can process more information rapidly, make analysis and judgments and one main thing he normally have confidence about his judgments and analysis. There is a term used called “Fight-or-Flight” responses towards stress by human. It is both, physiologically and behavioral. The term is characterized as the initial physiological response towards factors that threat the well-being of one, by both the genders, whereas behavioral sciences tells us that particularly female response towards stress is more driven by theory of “tend-and-befriend”. Tending entails to nurturing actions towards the protection of oneself and that of offspring that reduces stress and ensures protection. Befriending refers to establishing and maintaining a network in society that will minister to these protection activities. The bio-behavioral system triggers the “tend-and-befriend” prototype that initiates the attachment and care-giving systems. With the help of medical sciences we tell that neuro-endocrine integration in female human beings due to their reproductive hormones and endogenous release of amino acid in brain is the foundation of the tend-and-befriend behavior. A research by Miranda and Willie about the gender differences in the affect of post traumatic stress disorder suggests that the most alarming conclusion by the epidemiology of Post Traumatic Stress Disorder (PSTD) is that women are at higher risk of this given disorder. Further study have unveiled that the higher risk of PTSD in women can be due to the intensity of trauma they experienced, the young age at the time of incident, the loss of control over the incident and the week opinion about themselves relative to the trauma, great level of pre-traumatic dissociation, inadequate support from society, higher level of alcohol intake to deal with the traumatic event, along with the gender related minor behavioral neuro-scientific reaction to the event. The literature review has been conducted on the topic of stress and affects on both genders. Now questionnaires will be filled to find the rest out of the population. Further the data will be processed and findings relating to the literature review and problem statement will be discussed with conclusions and recommendations. Q # 1 : Does stress from social factors influence the intellectual abilities of students? Q # 2 : Does stress from health factors influence the intellectual abilities of students? Q # 3 : Does intellectual abilities influence the academic performance of students? Q # 4 : Which is the most influential stressor? Q # 5: Which gender is most affected by the stressors? H0 : There is no effect of stress from social factors on intellectual abilities. H1 : There is an effect of stress from social factors on intellectual abilities. H2 : There is no effect of stress from health factors on intellectual abilities. H3 : There is an effect of stress from health factors on intellectual abilities. H4 : There is no effect of intellectual factors on academic performance. H5 : There is an effect of intellectual factors on academic performance. H6 : There is no difference in the effects of stress among both genders. H7 : There is a difference in the effects of stress among both genders. To find out what are the factors that causes stress in Master Students. To find out the different effect of stress and its factors on both genders. The purpose of the study was to explain and answer our research questions of the linkage between the independent and dependent variables and if there is any difference in the effect with respect to gender. The type of research design is co relational research and sub type include research questions, hypothesis, independent and dependent variables, data collection methods and statistical analysis plan. The sampling technique for our research is infrastructure bias sampling technique which is the influence of the location and availability of pre-existing infrastructure for research. Quota sampling is also employed to incorporate the fair ratio of male and female students in our research. After that there needed a formal questionnaire which was to be designed with the help of already existing questionnaires on the same theme. For that purpose, our initial act was to look for the literature review to answer and gather most of the information pertaining to said questions. Having said that, several of the journals and articles are consulted whereby four of the independent variables were identified and taken further to study the gender differences. Variables that were taken out of the literature review were, as mentioned, Social Factors, Health Factors, Stress, Intellectual abilities and academic performance. Having found that, we further moved to the second phase of our problem statement what is the difference between the effect of male and female respondents of our research. For the purpose, a questionnaire was created with the help of above said independent variables. Questions were created from each variable and put in forth the project advisor, Miss Sara Sameen, for further correction and adjusting the scope of it. Having correcting the loopholes, a refined questionnaire was created having all the possible and relevant queries that might in one way or other depict the effect of stress on populace. Questionnaire was of scale in nature where as 1-5 points where given to each questions, 1 being Strongly Disagree and 5 being Strongly Agree. 2 was Disagree, 3 score was for neutral and 4 was for agree. As we are doing quantitative study, it was very necessary to select our sample very carefully. Our study focus on FAST-NU students from masters programs so we collect sample from on campus master students. We collect sample from both gender and we try our best to maintain equal ratio between both genders while gathering data so we can have accurate sample. We set target to get at least 50 or more valid samples for each gender. But in real we get data from almost 65 students for get at least 50 valid results. For the matter of gender differences, our sample was further divided into 2 sub-samples that were male and female. Half of the 100 questionnaire where being asked to be filled by females and the remaining half were given to male respondents. All the questionnaires were filled and recorded in SPSS software where male were allotted as 1 and Female as 2, which created 2 groups and the answers provided by these groups were then processed and the trend of effect of stress was found out by applying regression analysis on the group. It is clear from the discussion that regression test was most appropriate where as T-test analysis is also used to understand the difference of effects in male and female students. Since ethical implications were also to be taken under consideration, questionnaire was designed where the respondents were not asked about any personal information telling which might arise any privacy concerns for them. The questionnaire was total anonymous based and focused on only general behavior of stress where as surveyors are human and there are chances for any unintentional possibility of any impairment that could occur. Exploratory research is research conducted for a problem that has not been clearly defined. It occurs before we know enough to make conceptual distinctions or posit an explanatory relationship. In our research we are trying to explain the relationship between stress and intellectual abilities that leads an effect on academic performance. Stress, stressors and factors are also explained and explored. The first table of the output shows the model summary. Important statistics such as R squared can be found here. R is the correlation coefficient. As we doing the bivariate regression we will interpret R in the standard way as a measurement of the strength of the linear relationship between the two variables in the regression. R Square is the coefficient of determination, interpreted as the percentage of variance in the dependent variable explained by the collection of independent variables. This tells us about model’s overall Goodness to Fit. R Square equals 0.770, which is a very good fit. 77% of the variation in intellectual factors is explained by the independent variables which are health and social factors. The closer to 1, the better the regression line fits the data. As the value of r square is close to 1, it is useful in making predictions for the intellectual factors. The ANOVA table tells us about important statistics including all the sums of squares, mean square and overall F-statistics of the model. To see if Health factors and Social factors are significant predictors of Intellectual factors, we look at the significance F associated with health and social factors. This value is less than 0.05; F; 0.00 < 0.05, we reject the null hypothesis. Accepting our alternative hypothesis we now know that health and social factors are affecting the intellectual factors. So our hypothesis is statistically significant. This means that variability of 27% in the independent variables; health and social factors; we have variance in dependent variable that is intellectual factors. The t-test for Health factors equals -5.433, and is statistically significant, meaning that the regression coefficient for Intellectual factors is significantly different from zero. The t-test for Social factors is equal to 18.101. Checking the relationship if is reliable or not, we look at our results of P value, which are 0.000 and 0.000 we can see that health factors and social factors value are less than 0.05, which means that our results are statistically significant. This means that we can make predictions based on this relationship. Therefore, we will accept our alternate hypothesis that tells us that stress by social factors and health factors are affecting intellectual factors among the students of masters. The coefficient for Health factor is -0.063, meaning that for a one unit increase in Health factors; we would expect a 0.063 unit decrease in Intellectual Factors. The coefficient of Social Factors is 1.048, meaning that one unit increase in Social Factor; we would expect a 1.048 unit increase in Intellectual factors. R Square is the coefficient of determination, interpreted as the percentage of variance in the dependent variable explained by the collection of independent variables explaining us the Goodness to fit of the model. R Square equals 0.273, which is a very good fit. 27.35% of the variation in academic performance is explained by the independent variable which is intellectual factor. The closer to 1, the better the regression line fits the data. As the value of r square is close to 1, it is useful in making predictions for the academic performance. To see if Intellectual factors are significant predictor of Academic Performance, we will check if the results by looking at significance F. We will see if the results are reliable which means statistically significant, we look at the significance F 0.000. This value is less than 0.05; p; 0.000 < 0.05, we reject the null hypothesis and accept alternate hypothesis that tells us that intellectual factors are affecting the academic performance. So our hypothesis is statistically significant. This means that variability of 27% in the independent variable; intellectual factors, we have variance in dependent variable that is academic performance. Reviewing the output more carefully we found that the F-test is statistically significant, which means that the model is statistically significant. The R-squared is 0.273 means that approximately 27.3% of the variance of academic performance is accounted for by the model.. The t-test for Intellectual factors equals 6.104, and is statistically significant, meaning that the regression coefficient for Intellectual factors is significantly different from zero. Note that (6.104)2 =37.261, which is the same as the F-statistic. Checking our results we look at p value, which are 0.000 and 0.000 respectively; we can see that intellectual factor value are less than 0.05, which means that our results are statistically significant. Therefore, we will reject our null hypothesis and accept alternate hypothesis that stress by intellectual factors is affecting academic performance among the students of masters. The coefficient for Intellectual factor is 0.287, meaning that for a one unit increase in Intellectual factors; we would expect a 28.7 unit increase in Academic performance. R Square equals 0.041, which is not a very good fit. 4.1% of the variation in academic performance is explained by the independent variable which is Gender. The closer to 1, the better the regression line fits the data. As the value of r square is not close to 1, it is not useful in making predictions for the academic performance. To see if Gender Difference are significant predictor of Academic Performance, we will check if the results by looking at significance F. We will see if the results are reliable which means statistically significant, we look at the significance F 0.045. This value is less than 0.05; p; 0.045 < 0.05, we reject the null hypothesis and accept alternate hypothesis that tells us that Gender Difference is affecting the academic performance. So our hypothesis is statistically significant. This means that variability of 4.1% in the independent variable; Gender difference, we have variance in dependent variable that is academic performance. Reviewing the output more carefully we found that the F-test is statistically significant, which means that the model is statistically significant. The R-squared is 0.041 means that 4.1% of the variance of academic performance is accounted for by the model. The t-test for Gender difference equals -2.035, and is statistically significant, meaning that the regression coefficient for Gender Difference is significantly different from zero. Note that (-2.035)2 =4.140 (round about), which is the same as the F-statistic. Checking our results we look at p value, which are 0.000 and 0.045 respectively; we can see that Gender Difference value are less than 0.05, which means that our results are statistically significant. Therefore, we will reject our null hypothesis and accept alternate hypothesis that Gender difference is affecting academic performance among the students of masters. The coefficient for Gender difference is 2.956, meaning that for a one unit increase in Gender Difference we would expect 0.100 unit decrease in Academic performance. In order to investigate the difference between a dependent group, in our scenario males and females, on an approximately every independent variable, independent sample T-test is the perfect fit. To check the difference of health factors in both genders Independent sample t test is performed to check the affect of perception of a product between male and female group. In the above table, total numbers of participant are 100 from which mean of Male is 41.3200 and of Female is 40.7800. Whereas the standard deviation of Male is 7.21800 and female are 7.53032. The “Sigma value” is greater than 0.05, we know that variance between the two groups ( e.g; male & female) is equal. T value tells us about the obtained critical value which is 0.366 and our degrees of freedom is 98. The Sigma 2 tailed which is 0.715 tells us about the p- value linked with obtained critical value and df. In this table our p value 0.715 is greater than 0.05. This means that 71.5% chance is that we will obtain the same result and accept null hypothesis. A T test for independent sample showed us no significant difference was found between male and female in terms of stress by health factors, t(98)= 0.366, p = 0.715. On a five point scale where male get stress by health factors averaged 41 (S.D = 7.21) and female average 40.7 (S.D = 7.53). Thus, we conclude that there is no significant difference between stress by health factors on men and women. This is further checked through the graphs we have computed from SPSS as shown below. According to our group statistics of Table 2; the mean of male is 3.3170 with S.D of 0.79746 whereas of female is 3.2852 with S.D of 0.88315. Total number of participants was 100 for this test. The “Sigma value” is greater than 0.05; P-value 0.202 > 0.05; we know that variance between the two groups ( e.g; male & female) is equal. T value tells us about the obtained critical value which is 0.189 and our degrees of freedom is 98. The Sigma 2 tailed which is 0.851 tells us about the p- value linked with obtained critical value and df. In this table our p value 0.815 is greater than 0.05. This means that 85% chance is that we will obtain the same result and accept null hypothesis. A T test for independent sample showed us no significant difference was found between male and female in terms of stress by social factors, t(98)= 0.189, p = 0.851. On a five point scale where male get stress by health factors averaged 3.3 (S.D = 0.79) and female average 3.28 (S.D = 0.88). Thus, we conclude that there is no significant difference between stress by social factors on men and women. 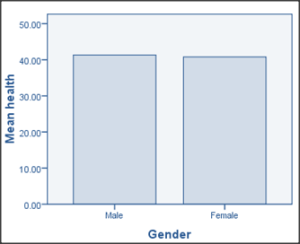 This is also checked through the graph computed from SPSS as shown below. The “Sigma value” is greater than 0.05; P value 0.573 > 0.05, we know that variance between the two groups ( e.g; male & female) is equal. T value tells us about the obtained critical value which is 0.521 and our degrees of freedom is 98. The Sigma 2 tailed which is 0.603 tells us about the p- value linked with obtained critical value and df. In this table our p value 0.603 is greater than 0.05. This means that 60% chance is that we will obtain the same result and accept null hypothesis. A T test for independent sample showed us no significant difference was found between male and female in terms of stress by health factors, t(98)= 0.0.521, p = 0.603. On a five point scale where male get stress by health factors averaged 3.62 (S.D = 0.66) and female average 3.55 (S.D = 0.56). Thus, we conclude that there is no significant difference between stress by intellectual factors affecting academic factors between male and female. 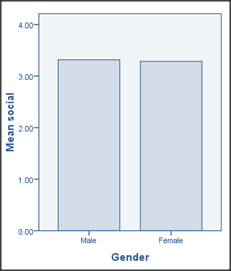 According to our group statistics of Table 4; the mean of male is 2.8558 with S.D of 0.26969 whereas of female is 2.7554 with S.D of 0.22137. Total number of participants was 100 for this test. The “Sigma value” is greater than 0.05; P value 0.885 > 0.05, we know that variance between the two groups ( e.g; male & female) is equal. T value tells us about the obtained critical value which is 2.035 and our degrees of freedom is 98. The Sigma 2 tailed which is 0.045 tells us about the p- value linked with obtained critical value and df. In this table our p value 0.045 is less than 0.05. This means that 4.5% chance is that we will obtain the same result and reject null hypothesis. A T test for independent sample showed us a significant difference was found between male and female affecting academic performance, t(98)= 2.035, p = 0.045. On a five point scale where male affects academic performance averaged 2.85 (S.D = 0.26) and female average 2.75 (S.D = 0.22). Thus, we conclude that there is a significant difference between male and female affecting academic performance. The hypothesis is stated in order to check whether there is a significant relationship between the independent variables and the dependent variables. The hypothesis Ho and H2 states that there is no effect of stress from health factors and social factors on intellectual factors. The results supported the hypothesis with the significance value 0.000 < 0.05 which is less than 0.05 dictates that the alternative hypothesis is accepted and it is been proved that there is an effect of health factors and social on intellectual factors. The hypothesis H4 stated that there is no effect of stress by intellectual factors on academic performance. The results supported alternative hypothesis with the significance value of 0.000 < 0.05. This tells that our H4 was rejected. Hence, there is an effect of stress by intellectual factors on academic performance. The hypothesis H6 stated that there is no effect of gender differences on academic performance of students. The results supported Alternative Hypothesis with the significance level of 0.045 < 0.05, tells us that there is an of gender differences on academic performance of students. In order to check who is more influenced by these factors, we run T test for independent samples. We got the results from Levene’s Test for Equality of Variance that Health factor and Social factors have same effects on male and female students. Similarly, we also checked the Levene’s Test for Equality of Variance for intellectual factors affecting academic performance, showing results of same significance. They also proved to have same variance. To check the gender difference affects on academic performance, we got the result from Levene’s Test for Equality of Variance showing same variance with sigma 2- tailed value of 0.045. This concludes us that P value is less than 0.05 means that gender difference does affects academic performance. Our overall project management was exactly as we kept planning throughout the project. The coordination between all three group members was great. The topic chosen for the research was decided with everyone’s mutual interest in it and after discussion with Miss. Fatima Saman. Deep literature review was needed to support our topic and for that we divided our work which lead us to change our conceptual framework again for good. All the analysis was done through SPSS software. Total time for the project we had was of four months and all work went with continuous guide from Miss. Sara Sameen. Cost of the project was not high as our main work was within the Fast university range. Resources used for the project were mainly online information, FAST Library and Research Guide books. Questionnaire is very important tool for a successful research. In fact research can’t go right if your questionnaire which you use for gathering data is not designed according to the research and cover all the required aspects. And for our research project, at very first step for development of questionnaire was to identify the points which we want to cover and measure for our research. Which were social factor, health factor, stress and its effects on academic performance of students? After that we write little introduction of our research project so people can understand what are our purpose for getting their responses. Then we select type of question and scale for the questionnaire. We use 5 points Likert scale for recording response of students. And generate questions for measurement of each variable of our research. We manage our questionnaire in a way which was easy to understand. All questions related to one aspect were grouped together so respondent don’t have to spent too much time for understand questionnaire. Further help and guidance were taken from some articles as well which are listed in bibliography (Frary 1996), (Janice Rattray 2005). The research was being conducted to find out the effect of stress on academic performance of master students. Our independent variables include Social factors and health factors where as gender is moderating. Another variable is intellectual ability which is dependent along with academic performance which is also dependent. Our null hypothesis stated that there is no effect of stress from social factors on intellectual abilities (Table 1) which has been rejected while alternate is accepted which state that there is an effect of stress from social factors on intellectual abilities. Same goes for effect of stress from health factors on intellectual abilities (Table 2) and effect of intellectual abilities on academic performance (Table 3) that we reject the null hypothesis that said that there is no relation between our independent and dependent variables. Moving on to gender differences, the research shows that there is no significant difference of gender difference on the effect of stress from social and health factors individually but there was an impact on academic performance on a whole when we put the data together (Table 4). There for we reject our null hypothesis, H6 in this case which stated that there is no difference in the effects of stress among both genders as the small difference was observed. This research has mentioned that although small, but gender difference exists in the effects of stress among male and female students. This research will be helpful for our juniors who wish to explore the topic of stress in details. It will help them identify the variables and their effects, while it gives them opportunity to do a research on that identified difference of stress in both the genders. Alessandro Bartolomucc, Paola Palanza, Paola Sacerdotec, Alberto E. Paneraic, Andrea Sgoifoa, Robert Dantzerd, Stefano Parmigiania. “Social factors and individual vulnerability to chronic stress exposure.” In Neuroscience & Biobehavioral Reviews, by Paola Palanza, Paola Sacerdotec, Alberto E. Paneraic, Andrea Sgoifoa, Robert Dantzerd, Stefano Parmigiania Alessandro Bartolomucc, Volume 29, Issue 1, Pages 67–81. February 2005. Bruce G. Link, Jo Phelan. “Social Conditions and Fundamental Cause Disease.” Journal of Health and Social Behavior, 1995: 80-94. Bruce S McEwena, Robert M Sapolsky. “Stress and cognitive function.” In Current Opinion in Neurobiology, Volume 5, Issue 2, Pages 205–216, by Robert M Sapolsky Bruce S McEwena. Elsevier B.V, April 1995. Cádiz, Jennifer. Silently Stressed, A survey into student mental wellbeing. Edinburgh: National Union of Students, http://www.nus.org.uk/thinkpositive, 2012. Carino, Kathleen. Stress and Academic Performance: a student research project. 2013. http://deliberateexcellence.wordpress.com/2013/08/05/stress-and-academic-performance-a-student-research-project/. Centre, Klinic Community Health. “Stress & Stress Management.” 2010. Cnchikwe. What is intellectual Ability, and how is it relevant to OB? 2009. http://mymbaresearch.wordpress.com/2009/11/30/what-is-intellectual-ability-and-how-is-it-relevant-to-ob/. Cobb, S. “Social support as a moderator of life stress.” American Psychosomatic Society, 1976. Development, Davidson Institute for Talent. Characteristics of intellectually advanced young people. 2011. http://www.davidsongifted.org/db/Articles_id_10501.aspx. Gabriel, Brian. What Is Intellectual Ability? 2010. http://www.ehow.com/info_8750469_intellectual-ability.html. Genova, Erika. Stress and Academic Achievement in High School. Comparative study, North masspequa: Plainedge High School, 2010.
glasgowspcmh.org.uk. What social factors can affect stress? 2012. http://glasgowspcmh.org.uk/information/social/what.php. Jen Wilson, GoodTherapy.org. College Students Report Stress Affects Academic Performance. 2011. http://www.goodtherapy.org/blog/college-student-stress-affect-academics/. Kelly Stanton, MS, PT. Developmental Milestones: Intellectual and Behavioral. 2009. http://www.abilitypath.org/milestone-concerns/developmental-milestones-cognitive-behavioral.html. Kessler RC, Price RH, Wortman CB. “Social factors in psychopathology: stress, social support, and coping processes.” Annu Rev Psychol. 1985;36:531-72, 1985. Nordqvist, Christian. What Is Stress? How To Deal With Stress. April 2009. http://www.medicalnewstoday.com/articles/145855.php. Shaak, Natalie. Academic Achievement Literature Review. Drexel University, 2008. Shoukat Ali, Zubair Haider, Fahad Munir, Hamid Khan, Awais Ahmed. Factors Contributing to the Students Academic Performance. Shoukat Ali, Zubair Haider,, Fahad Munir, Hamid Khan, Awais Ahmed, Islamia University. Stewart, Lam, Betson,Wong. “A prospective analysis of stress and academic performance in the first two years of medical school, Volume 33, Issue 4, pages 243–250, .” In Medical Education, by Lam, Betson,Wong Stewart. John Wiley & Sons Ltd, 2002. Thinking, Foundation For Critical. “Valuable Intellectual Traits.” 2010. Tom Deliens, Peter Clarys, Ilse De Bourdeaudhuij, Benedicte Deforche. “Weight, socio-demographics, and health behaviour related correlates of academic performance in first year university students.” 2005.
i want to cite this paper how i can get citation. You can use the site name or link as well in your references. Name of author? Published date? I want to cite this paper how I can get citation. I want to cite this paper how I can get citation? I am hoping for your positive response. Thank you very much. Please use the website link/post link as reference. where is the citation of the author pritchard (1996) ??? Hello. I am asking for your permission to cite this in my research paper. How can I get the citation? May I know the name of the author and the published date please? I am hoping for your response soon. Thank you so much.